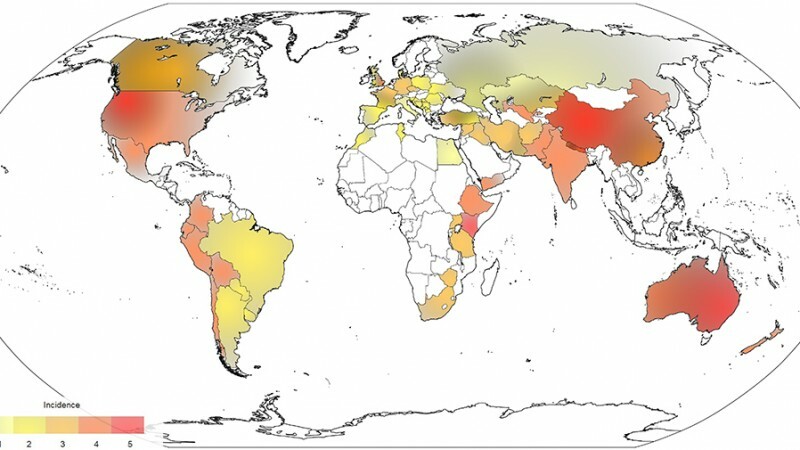 High grain producing countries in more temperate regions, such as the US, China, and Australia, tend to have higher incidences of stripe rust than countries such as Russia or Peru. Countries with no data are shown in white. Regions with cooler summers (such as the pacific northwest) are highly favorable areas for stripe rust oversummering. Regions with mild winters (such as states bordering the Gulf of Mexico) are highly favorable for stripe rust overwintering. Conditions have been shown to be favorable for both overwintering and oversummering only along the coast of Oregon and Washington state.